Please note that the content of this book primarily consists of articles available from Wikipedia or other free sources online. Dwayne Paul Adams is a Canadian actor, currently in Toronto, Ontario. 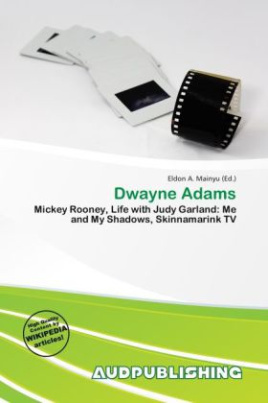 Adams is best known for playing actor-comedian Mickey Rooney in the first half of the miniseries Life with Judy Garland: Me and My Shadows. Adams also starred as the voice and body of C.C. Copycat for the 1998 season of the Canadian children's show Skinnamarink TV as well as playing the character live and on stage with the show's stars, Sharon, Lois & Bram. Selected filmography: Life with Judy Garland: Me and My Shadows (2001 TV), Expect No Mercy (1996) (adr voice). Series: Skinnamarink TV (1998) .